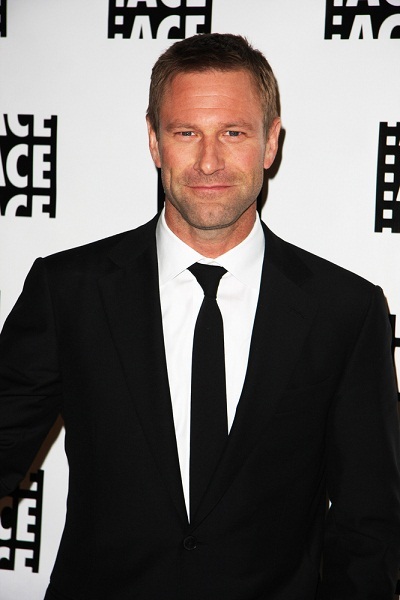 Aaron Eckhart is an American actor. His father is of German, and possibly one eighth English, descent. His mother is of German, English, Scottish, and Northern Irish descent. Aaron’s paternal grandfather was Joseph Eckhart (the son of Conrad Eckhardt, Sr., and Maria Barbara Hofferber/Hoffeiber). Joseph was the son of ethnic German immigrants from the village of Frank, in South Russia, Volga Germans; some of Joseph’s siblings had been born in Russia. Conrad was the son of Conrad Eckhardt and Maria Magdalena Fahrenbruch. Aaron’s great-grandmother Maria Barbara was the daughter of Johann Georg Hofferber and Barbara Walter. Aaron’s paternal grandmother was Lucille Mary Thayer (the daughter of Elmore Rainey Thayer and Dorthea/Dora Christine Fiechtner/Fichtner). Elmore was the son of Lewis W. Thayer, who may have been of English ancestry, and of Anna Minch, who was of German descent. Dorthea was born in Nebraska, the daughter of Johannes Biechtner Fiechtner and Barbara Fritz, ethnic Germans from Hoffnungstal, Tiraspol District, Odessa, Russia. Aaron’s maternal grandfather was Russell Edward Lawrence (the son of Robert Harris Lawrence and Martha Ellen Gibson). Robert was the son of Robert Barclay Lawrence and Tace/Tracy Bates. Martha was born in Galston, Aryshire, Scotland, the daughter of Robert Gibson and Jane/Jean White. Aaron’s maternal grandmother was Mary Florence Miner (the daughter of James Monroe Miner/Minor and Mary Florence Boies). James was the son of Monroe Minor/Miner and Margaret Emmaline/Angelene Williamson. Aaron’s great-grandmother Mary Florence was the daughter of John Boies and Mary Elizabeth Phillippi, who was born in Ohio, to German parents.